Some of the most efficient and cost-effective handling and moving equipment systems in today's industrial environment are powered by compressed air. Air powered (pneumatic) handling equipment offers the power to handle and move heavy objects and machines up to 400 tons and beyond. Our material handling equipment can lift and move everything from large rolls of paper to heavy machinery.Here are two such pneumatic handling systems that are driven by compressed air. To the left is a low profile handling system which comes in kit form and includes everything you need to set up a handling system right out the box. 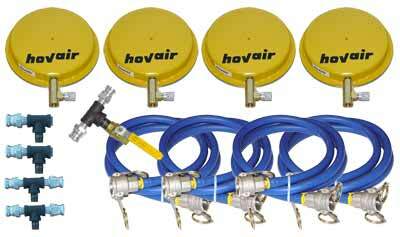 To the right is a standard pneumatic handling system, again in kit form so you can be up and running quickly. Our web site at hovair.com has a series of videos showing some of our handling and heavy load moving products in action. See the links below. Hovair Systems are a leading air bearing manufacturer; we are heavy machinery equipment movers with 50 years of experience in air bearing design and manufacturing. Did you know that an air bearing load handling system will make heavy load moving so much easier, and way more cost effective? Hovair Systems air bearing powered systems are designed to lift and move loads and machines that are too heavy for conventional methods such as forklift trucks, overhead gantry and crane methods. Air powered (pneumatic) load handling systems work in a series of four or more, they lift your load away from the floor much the same as a Hovercraft. Our products use the same principle: air film technology.